Prof. Osucha’s chief areas of research expertise are Nineteenth- and Twentieth-Century American Literature and Culture, African American Studies, Legal Studies, Critical Race Studies, Visual Culture, Queer Studies, and Feminist Theory. Her book manuscript, The Post-Racial Past: Race, Privacy and Identity Before the Obama Era, examines historical productions of the discourse commonly called “the post-racial” prior to the twenty-first century, at the intersections of law, literature, and media culture. The Post-Racial Past argues that contemporary post-racialism originates in the legal history of “privacy,” which Prof. Osucha traces beyond the formal recognition of a right to privacy in constitutional law to antebellum slave law that regarded the sovereignty of slave masters as a natural right rooted in the master-slave relation’s “private” nature. Through linked analyses of literary works and legal writing–including Supreme Court opinions, statutory laws, and legal scholarship–and visual texts from cinema and television to nineteenth-century commercial media, The Post-Racial Past argues that the legal right to privacy’s development via racialized technologies of publicity, surveillance, and sexuality made broader discourses of race, privacy, and identity increasingly enmeshed and conceptually interdependent. Exploring the acute racialization of a rights claim overtly linked, throughout its history, to gendered and sexuality-based identity claim, the book demonstrates how legal privacy anticipated, rehearsed, and consolidated post-racialism prior to its becoming, at the start of the Obama Era, a dominant ideology still pervasive within the political and cultural contradictions of American racism in the present. Prof. Osucha is appointed to the faculty steering committees of the Programs in American Cultural Studies and African American Studies and has also served as a member of the Program Committee for Gender and Sexuality Studies and as a founding member of the college’s Arts Collaborative. Recent public humanities work includes serving as lead project scholar to develop the program Violence and Belonging: The 14th Amendment and American Literature, which examines legacies of the Fourteenth Amendment for the nation’s literary history, for the Maine Humanities Council’s public libraries’ reading groups project, and co-curator of Site Seeing: 9/11 Through Documentary Shorts, featuring short documentary and experimental films created as artistic responses to 9/11, which Prof. Osucha developed for Portland, Maine’s SPACE Gallery, . Carol Batker, Eden Osucha, and Augusta Rohrbach, eds. 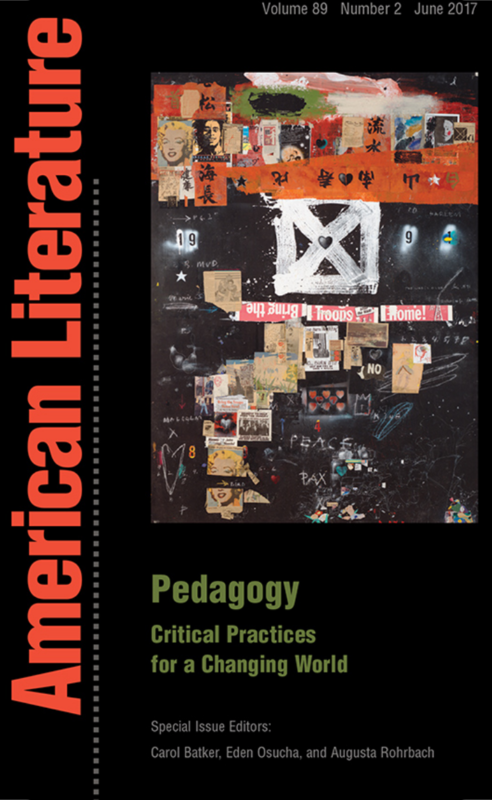 Special Issue: “Pedagogy: Critical Practices for a Changing World,” American Literature, 89.2 (2017). Prof. Osucha’s awards and honors include the Mrs. Giles Whiting Fellowship for Teaching Excellence, administered by the Bates College Office of the Dean of Faculty, the Nancy L. Buc Postdoctoral Fellowship from the Pembroke Center for Teaching and Research on Women at Brown University, and a Dissertation Fellowship from the Ford Foundation Diversity Fellowships Program, administered by the National Research Council of the National Academies. A published poet and creative writing teacher, Prof. Osucha is one of the curators of the English Department’s Literary Arts Live reading series, which brings poets, novelists, and creative non-fiction writers to campus to give public readings and serve as guest instructors in the department’s creative writing program. Visiting writers whose visits Prof. Osucha has personally arranged include: Emily Barton, C.A. Conrad, Ross Gay, Aracelis Girmay, Gabriel Gudding, James Hannaham, Courtney Eldridge, Samantha Hunt, Caroline Knox, Dorothea Lasky, Sarah Manguso, Ander Monson, Tessa Joseph-Nicholas, Paul LaFarge, Dinaw Mengestu, Brian Kim Stefans, Christopher Vitiello, Colson Whitehead, Dara Wier, and Magdalena Zurawski.